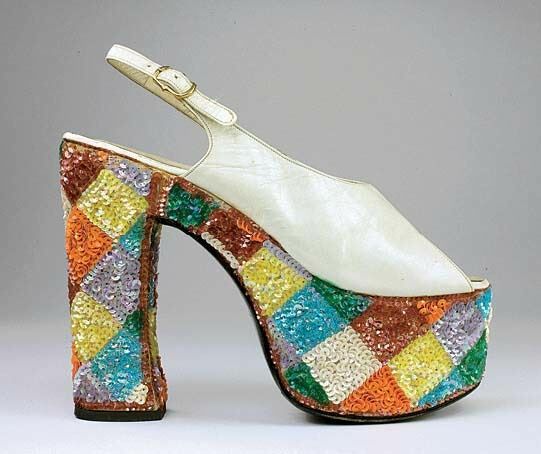 Less a fête for the feet than a feast for the eyes, much of the haute couture footwear on display in Killer Heels: The Art of the High-Heeled Shoe at the Currier Museum is “barely wearable,” admits curator Samantha Cataldo. “Any woman who has put her foot in a non-sensible shoe knows they are not comfortable.” Instead, the 150 shoes range from eighteenth-century European embroidered precursors of the “pump” to Dutch designer Iris van Herpen’s mounds of tangled black strands, which resemble the roots in a mangrove swap, and were produced by a 3-D printer. All are presented as design objects akin to titled sculpture, and as “layered cultural symbols in narratives of attraction, transformation, empowerment, and play,” per exhibit notes from the original show organized by Lisa Small at the Brooklyn Museum last year. 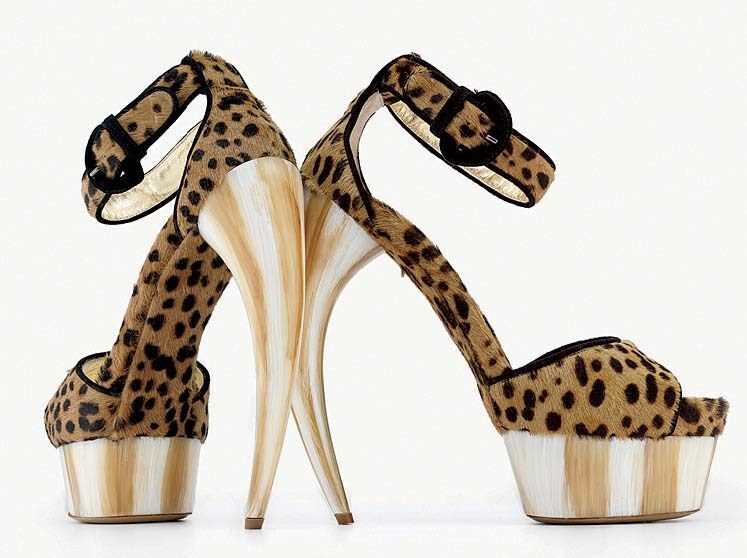 Take Walter Steiger’s fetishistic “Unicorn Tayss.” Leopard-print vamps and ankle straps top six-inch curved stiletto heels, à la golden horns. Rem D. Koolhaas’s “Eamz” capture the industrial chic of mid-century designers Charles and Ray Eames: fire-engine red flats that appear hoisted by a metallic lever at the heel. Nicholas Kirkwood’s suede “Pumps,” encrusted with Swarovski crystals in a floral pattern, lack any utility. Some 50 examples on display are historic, such as satin-weave-embroidered silk Manchu-era platforms, Chinese shoes for bound feet, and traditional wooden Japanese geta from the 1800s. They point to the Eastern origins of high heels. 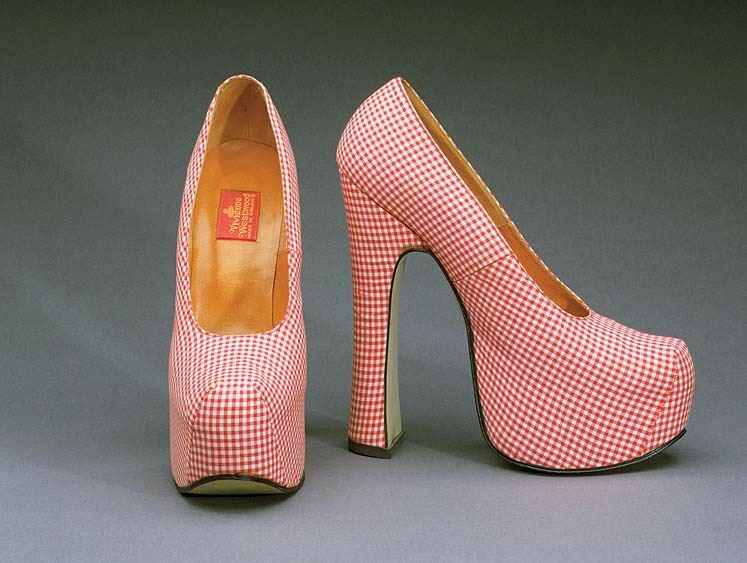 (Shoes have always walked the line “between form and function,” Cataldo says.) Stilted bath sandals in the Ottoman Empire kept feet dry, and heeled equestrian Persian footwear kept riders firmly in stirrups, but both soon evolved as fashion styles that represented physical status, beauty, and even worldly power.